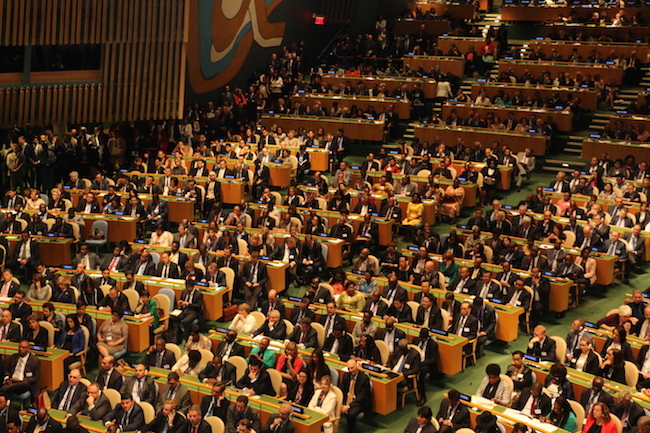 The issue of ‘universal development agenda’ is the issue of the twenty-first century. Never before have so many suffered amidst liberty and luxury for the few. The wealth of single individuals exceeds the wealth of many nations. In highly developed countries, the number of persons living past 80 years is soaring. In deprived and convulsed countries, the average longevity is but half that age. While citizens of some African and Asian countries are starving, the rich countries are beset with obesity. Discrepancies of these types are morally disturbing. The United Nations is ideally suited to ending these shocking inequalities because it hosts all the nations of the world and endows each with identical voting power in the General Assembly. The poorest and the weakest are equal to the richest and the strongest. The most urgent priority to promoting global partnership for viable development is the ending of warfare. War, whether intramural or international, wreaks havoc on the elements necessary for health, housing, education, employment, the rule of law, the environment, and happiness generally. War is enormously expensive. It diverts resources from schools, hospitals, roads, and telecommunications to AK-47s, Kalashnikovs, missiles, bombs, and artillery shells. Children are deprived of educational opportunities. By killing or deracinating the flower of youth, war keeps a country immersed in misery and underdevelopment. War also arrests economic development. Capital flight is staggering. Foreign investment withers. Infrastructure is destroyed. Lawlessness hikes the risks of any business enterprise. The consequence is widespread poverty. War also fosters disease and physical ailments. Individuals are more susceptible to crippling bacterial and viral illnesses when their housing and food is shortchanged. Further, war destroys hospitals and handicaps the supply of medicine. Medical workers frequently shy from dangerous conditions. And refugee camps are notorious for insalubrious quarters. War also creates a culture antithetical to democracy and the rule of law. It teaches that disputes should be resolved by the bullet in lieu of the ballot box. It engenders suspicion and distrust that confound democratic politics resting on a confidence that elections will be free, fair, and accurate. The second urgent global development priority should be universal literacy and education. As Socrates explained, the unexamined life is not worth living. This observation is made not to deride or degrade the uneducated, but to underscore the criticality of education to making life morally meaningful and fulfilling. Mean-spirited and wicked politicians regularly exploit ill-educated voters to pursue divisive racial, ethnic or religious agendas. That explains why free and compulsory public school education is a feature of every flourishing democracy. The United Nations should develop educational yardsticks that a nation must satisfy to receive economic or military aid from third parties, including the World Bank and the International Monetary Fund. The yardsticks should be incorporated in a treaty to be ratified by all United Nations members. The idea of educational yardsticks with teeth creates an agonizing moral dilemma. Suppose a misgoverned nation falls short. Economic aid ends, but the suffering is felt by the common citizen, not the typically coddled rulers. That juxtaposition seems unjust and immoral at first glance. But think of the consequences of continuing aid to a brutal government, either directly or through international or private indigenous organizations. The aid relieves misery, and dulls the popular incentive to revolt and to install a more enlightened regime that would eagerly educate the nation’s citizens. Future generations would forever inherit an uneducated nation and despotic government. Morality in public life should be the greatest good for the greatest number. And to decline sanctions on a living generation despite the greater wretchedness visited on posterity would seem to fail that test. Third on the global development priority should be the elimination of poverty and the securing for every man, woman, and child a right to flourishing health, a clean environment, comfortable housing, and nutritious food. The goal is not a choice but a moral obligation. A preferred position for the poor is the North Star of all religions. Thus, rich countries should transfer much of their riches to poor countries. There is no moral excuse for regimes in poor nations to forfeit the rich self-help opportunities for economic growth. As Hong Kong, Singapore, and Japan teach, economic prosperity turns more on human capital and the rule of law than on the flukes of natural resources. Think of some oil rich nations mired in misery, desolation, deprivation and destitution. A fourth global development priority should be the ending of all racial, ethnic, or class hatreds or enmities, like Islamophobia, Xenophobia, racism, anti-Semitism, etc. Think of the horrifying quantity of violence in the world whose fundamental cause can be traced back to such social divisions. It infects every country on the planet. And if even one person suffers from invidious discrimination, then all are threatened and civilization has been tarnished. The United Nations Human Rights Council is ideally suited to fashion a program to achieve the desired result. It can assemble the best thinkers and models to draft laws and educational programs that will deter and prevent the abomination of sharp social divisions. Next on the list of global development priorities should be the attainment of equality for women. Experience and intuition both demonstrate that women are as intelligent as men. They are as entrepreneurial and disciplined. They contribute every bit as much to economic growth and social cohesion as men. It is thus imperative that women receive the same legal rights and social dignity as men if global development objective is to advance. Females should receive the same educational, employment, business, and professional opportunities as men. They should be equally eligible to serve in public office or to seek elective office. Women should enjoy the same social rights as men. A clean environment is also essential to global development priorities. Pollution is more than twice cursed. It damages crops; it kills lakes and rivers; it occasions disease. The poor are invariably the worst affected by environmental pollution. They are least able to afford medical treatment. They are least able to move or change their occupation, if at all they have an occupation in the first place. They are least able to pay for the costs of self-protective measures. A clean environment, therefore, is a key element of community fairness and justice. Let me with great humility offer a few closing observations about the entire global development agenda enterprise. It is characteristic that national or international organizations employ quantitative benchmarks to measure success in meeting enumerated objectives. For instance, a longstanding objective has been for each nation to contribute a specified percentage of its gross domestic product for humanitarian or foreign aid. Companion quantitative benchmarks have been set for literacy, vaccinations, annual income, longevity, smoking, etc. There is nothing inherently mischievous about these development yardsticks. But they should never distract from our recognition that the highest in global development agenda consists of non-quantifiable characteristics. These would include acts of charity, humility, courage, benevolence, magnanimity, self-restraint, and non-vindictiveness. It would seem to me to turn logic and morality on their heads to award higher sustainable development acclaim to a nation whose citizens were universally economically prosperous, literate, healthy, long-lived, non-polluting, but also mean-spirited, selfish, and egotistical than to a nation whose citizens were impoverished, plagued by disease, but were generous in time, effusive in hospitality, austere in habits, and selfless for the community. During our chapters between ashes to ashes and dust to dust, let each of us live and comfort ourselves so that our tombstones will inspire and uplift for the ages.